Tickets for Mickey’s Not-So-Scary Halloween Party and Mickey’s Very Merry Christmas Party are now on sale. 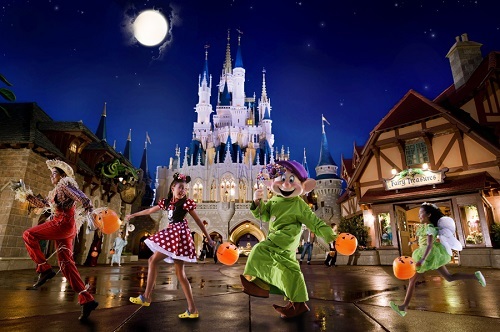 Mickey’s Not-So-Scary Halloween Party takes place on select nights in September and October and includes trick-or-treating around the Magic Kingdom in addition to Mickey’s Boo-to-You Halloween Parade, Happy HalloWishes fireworks, and Disney characters in Halloween costumes. The dates for Mickey’s Not-So-Scary Halloween Party are: September 1, 9, 12, 14, 16, 19, 21, 23, 26, and 28; and October 2, 3, 5, 9, 10, 13, 16, 17, 19, 21, 23, 24, 26, 28, 30, and 31. Ticket prices start at $62 for guests ages 10 and older and $57 for guests ages 3-9, except on certain nights when the ticket prices are higher. Ticket prices for October 30 and 31 are $77 for guests ages 10 and older and $72 for guests ages 3-9. In November and December the Magic Kingdom is transformed into a festive wintry wonderland for Mickey’s Very Merry Christmas Party. This holiday party includes the Castle Dream Lights on Cinderella’s Castle, Mickey’s One Upon A Christmastime Parade featuring Santa Claus, Holiday Wishes fireworks, live entertainment, complimentary cookies and hot cocoa, and snowfall on Main Street U.S.A. Dates for Mickey’s Very Merry Christmas Party are: November 7, 10, 13, 14, 16, 20, 21, and 30; and December 2, 4, 5, 7, 9, 11, 12, 14, 16, 18, and 19. Ticket prices start at $67 for guests ages 10 and older and $62 for guests ages 3-9. Tickets on select dates in November are $71 and $66, while the ticket prices for December 19 are $74 and $69. Tickets are available online at the Walt Disney World Special Events Tickets page. This entry was posted on Thursday, May 8th, 2014 at 12:00 pm	and is filed under Planning, Theme Parks, Tickets. You can follow any responses to this entry through the RSS 2.0 feed. You can leave a response, or trackback from your own site.